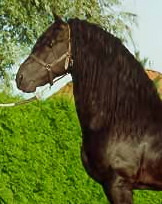 Anita is a FHANA registered ster mare imported from Holland. She earned her ster status the first time as a three year old. Her father is Jasper (past world grand champion) and her mother is Alma van Noordwijk whose sire is Peke. Her mother line is ster, ster, ster, ster & preferent. On her papers she has 6 ster, 5 ster preferent, 1 ster prestm., 4 preferent, 1 model preferent, and 1 model pref prestm. For a total of 18 predicates.Her sire Jasper is well on his way to earning Preferent status in the future. Making that number 19, excellent! Having a Jasper mare is rare in the U.S.
During the kuering she received an 8.5 on her trot which is a number higher then many of the model mares and approved stallions. 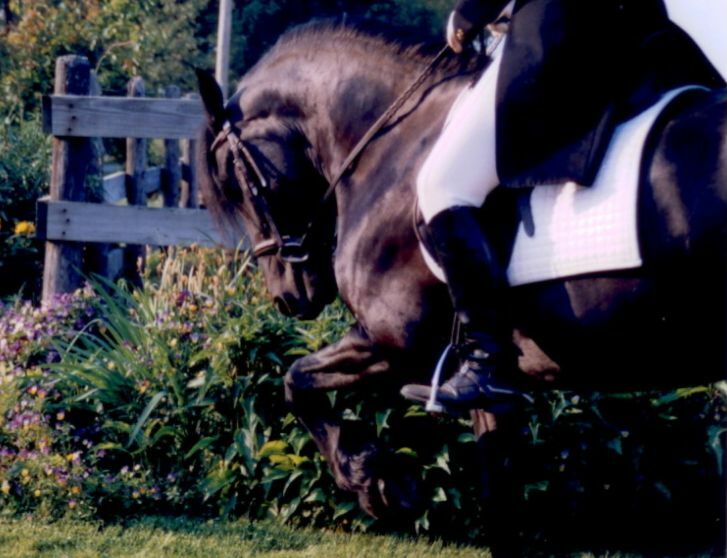 Her movement is forward and animated with a powerful hind end coming underself nicely in the trot and canter and an overstride at the walk. She has mane past her shoulder and enough tail for three horses, she also has beautiful feathering and exotic mapping. She has excelled in dressage in the past and is now passing on her beauty, movment and lovely disposition to her stunning offspring. She has produced 2 by *Nico and both of them are ster quality. 4 approved stallions, 40 star stallions and has a 50% ster rating on mares. Excelling in dressage he is presently showing 4th level. 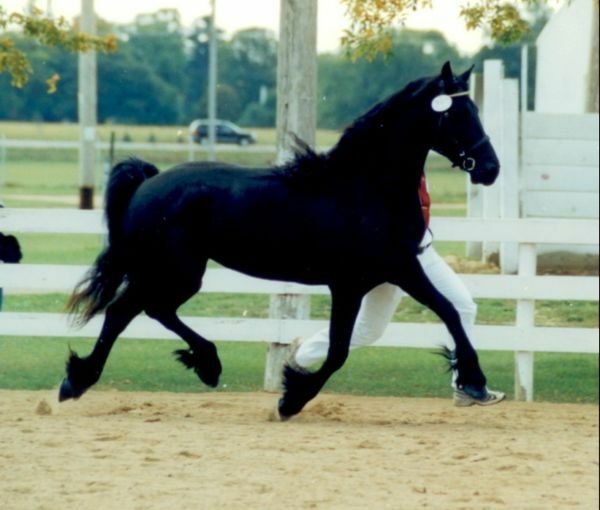 FPS stallion Peke 268 was known for having the most beautiful head of all living Friesian sires prodcing offspring performing well in dressage and driving. 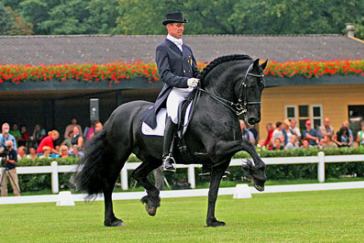 Anita's sire Jasper 366 is an excellent and very popular approved Friesian stallion in Holland. Known for his impressive trot, big suspension and extension, and fabulous temperament and work ethic. Jasper has already sired four approved sons (Jisse 433, Haitse 427, Dries 421 and Beart 411) along with forty Star stallions and he was only born in 1995! Jasper was named world champion in 2002. Two Jasper sons have achieved the top spots of the 2008 FPS Stallion Show. World Grand Champion went to Haitse 425 (Jasper 336 x Rypke 321) and Reserve Champion went to Beart 411 (Jasper 366 x Feitse 293P). 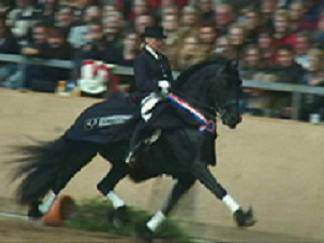 Beart 411 was also named World Grand Champion in 2006. Interestingly, Haitse and Beart also were top performers according to the number of 1st premie foals that they sired in 2007. They each sired 33 first premie foals in 2007! Jasper has a similar proven record with producing female offspring - he has an amazing 50% lifetime star rating on mares (as of end of 2006). To date he has produced 20% first premie foals and a total of 75% 1st and 2nd premie foals. And if all this is not enough, Jasper also is a very successful 4th level dressage horse. Anita's dam sire Peke 268 was known for having the most beautiful head of all living Friesian sires. Peke reached the “Honorary Class” for driving – very few Friesians ever reached this honor. He was also a good dressage horse. Peke was known for passing on beautiful heads and necks, strong hindquarters, exceptionally good gaits – especially the walk and trot, and excellent leg conformation. His offspring have performed well in dressage and driving.